Selecting the right sports bra is more than just finding the right size, it will also depend on your level of activity and the amount of support that you need. LACE provides a Sports rating for each sports bra, ranging from 1 to 4. The higher the number of the Sports rating, the more support the bra has. All of the sports bras sold at LACE are suitable for women with larger cup sizes, across a range of low, medium and high-impact activities. What is a sports rating? The sports rating is exclusive to LACE and is applied to all sports bra styles across all brands. Consideration for the sports rating includes factors such as fabrics and construction, like the inclusion of underwires, internal supports and seams; the level of encapsulation and compression in the design; along with the amount of coverage, and of course feedback from customers and the LACE models and staff, help to determine the rating. What sports rating do I need? Sports bras with a rating of 1 to 2 are most suitable for low-to-medium impact activities such as yoga, walking, and strength and resistance training. Styles with a rating of 2 to 3 are more appropriate for medium impact activities such as biking, skiing and dancing. Finally, those rated 3 to 4 are best suited for high-impact exercise that includes running or jumping or even an activity like horseback riding. If in doubt of which level of support to choose for your activity, select the higher sports rating for increased support. Look for the sports rating graphic on the first photo of each sports bra style throughout the website. Please note that most sports bra styles are available across a vast range of sizes. Therefore, the sports rating may be higher in some of the smaller band and cup sizes of a particular style, and you may find that some styles with lower sports ratings are suitable for higher impact activities. For more support in larger cup sizes, even for low impact activities, choose a higher sport rating for additional support. 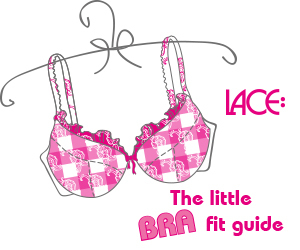 LACE is committed to offering supportive and functional sports bras in D+ cups.